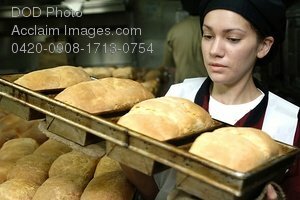 Description: Free, public domain image: Female Baker Making Bread. Female, Navy baker putting up loaves of freshly baked bread. The bread and other food prepared by the galley staff is used to feed the sailors on the USS George Washington.